Having a pilots license is a privilege. It is that document which you work hard for and entitles you to take the air and fly the Canadian skies. Your personal pilot license (PPL) guarantees you untold adventure in itself, but it is also a gateway to much more. One of the most popular post types on our social media is float planes. Without exception, Canadians react to aircraft on floats with more comments and more likes than anything else. It is built into us. It’s in our Canadian DNA. Canada has 20 percent of the worlds’ fresh water as well as the second largest airspace on the planet. It simply makes sense to combine the two. It makes sense therefore, that a natural progression to your PPL is your float rating. 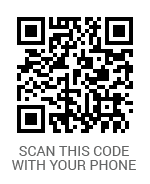 A rating is not a license, it is an addition to your license allowing you to do that thing. There are ratings for multi-engine, night flying and OTT (over the top) and, obviously, floats. 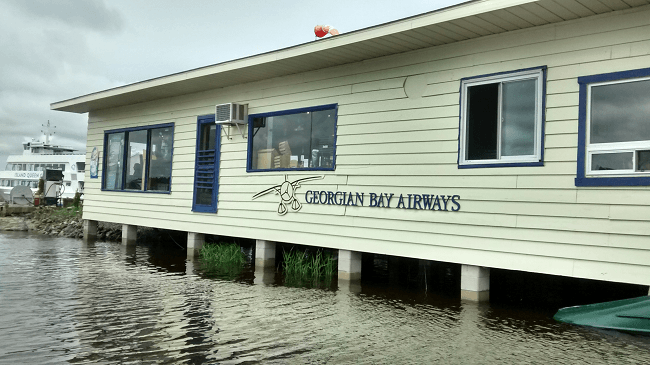 It’s worth noting that for some ratings, a CPL can sign you off or even a private instructor, but for floats, the chief pilot under the operating certificate needs to endorse your license, so better do it right. Let’s start with a distinction. A float plane has (usually) two pontoon type floats on its underside to allow water operations. A seaplane has the fuselage designed like a boat hull, therefore the floatations is a part of the aircraft itself, not something you add-on. 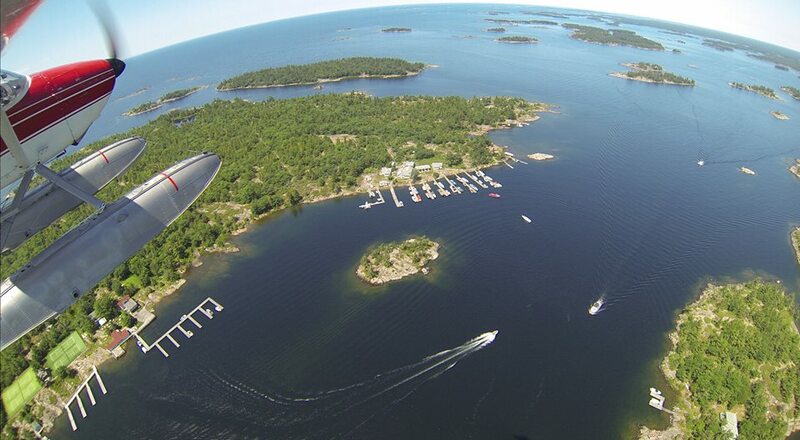 What better place to learn about float flying in Canada than from a long-standing and well renowned training facility, namely Georgian Bay Airways, of Parry Sound southern Ontario. We contacted Keith Saulnier for an interview and he happily agreed to show us around. Firstly, as soon as you meet Keith, you’re going to notice the cool demeanour of a professional bush pilot. I have met a few and they simply don’t come across as guys (or gals) that would ever panic. You also know immediately that float flying is a passion, a family institution and a huge part of his life. Keith’s wife Nicole is also a commercial bush pilot. 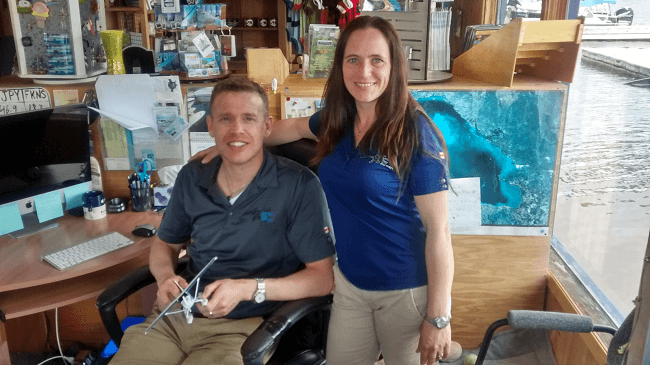 They have both worked their way around the world with their flying skills, something which is a definite option for those pilots wanting to make a career out of float flying. We met Julie, the CPL from Seneca college who was happily trimming trees on the property. Everyone pitches in here and everyone gets involved in everything. With a family of three kids, only four years apart, expect to see the family having fun around the place. Every one of the kids were flying well before their first birthdays and Nicole was grounded only by her baby-bump (can’t pull the yolk back all the way when there’s a person in the way) and was back to work within 18 hours of delivering her last munchkin. Yeah, these guys are bush pilots – did I mention that? GBA essentially does things in threes. Their operations are split into tourist flights, charters and training. Their store is split into ops, training and retail. This tri-organization and multi-faceted approach to aviation business differentiates GBA by allowing several profitable activities to combine into one secure and established company. Looking around the facility, it is immediately apparent that the set-up is designed to be social. There is a pilot longe to simply hang-out and talk about flying. There is an ice-cream store in the back to keep everyone happy. There is the obvious training rooms and study facilities also but they are not sterile school rooms but pilot training rooms. Talking about the rating, there are a couple of options. The basic rating, that sign off on your license, is around 7-10 hours of flight time as well as ground training and book-work. The commercial 50 hour bush course is designed to get the candidate to employable standards (this would require a commercial license also). Keith advised us that every pilot is examined and trained like a potential employee, making the the best they can be to a higher standard. One of the questions often asked is “I don’t have a float plane so why would I do it?” The answer is in several parts really. Firstly, if you take this course and are an aircraft owner, bet you’ll be looking to retrofit your bird or buy a floater soon – no kidding. There are several aspects to float flying which helps every pilot including wind reading, depth perception, situational awareness and emergency procedures – all of which feature highly in the training course. Short and soft field landings will improve with float training and those are skills every pilot needs. There are opportunities to rent float planes. There are also several clubs and fractional ownership possibilities for the pilot who really wants to keep up with their skills, but this is one of those ratings you can do just for the fun of it. Even if you never fly floats again, this training is designed to improve your skills and give you an incredible experience. To make the experience even better, the Saulniers have rental apartments for their students which cost – wait for it – nothing. “You can come to GBA, for a ‘fly-cation’, hang with us, train, fly floats and enjoy the area” says Keith. If you factor-in accommodation and everything, you’ll find that this all makes a lot of sense for your wallet. Sounds appealing. If you don’t know Georgian Bay, picture Eden (before the apple business) and you’ll have a good idea. Dotted with thousands of islands, beautiful scenery and forests as well and great fly-in restaurants and destinations and you’re getting the idea. This is the ideal place to fly floats from May to October. GBA run spring refreshers too, in the first or second week of May, so if you’re a floatie already, drop them a line for a bit of updating. Their facility includes docking and fuel so they are ready for you to drop by and shoot the, well, you know, over ice cream. At time of writing, fuel was priced much better than airfields in the area so indicating a dedication to pilot services, not the almighty bottom line. Overall, we had a great visit with the Saulniers. We were super impressed with their dedication, organization and facilities. You can bet we’ll be booking a course when we stop spending all our money on the website 😉 stay tuned for that.